Trenton's Kelsey Building, at the corner of Barracks Street and West State Street, has a remarkable story to tell. The building was commissioned by Henry Cooper Kelsey to be a living memorial to his wife, Prudence Townsend Kelsey, after she succumbed to illness. He was so devastated by her death that he decided to create a new home for the School for the Industrial Arts in Trenton to honor her memory. Future generations and the city would benefit from this expanded institution, and Kelsey could live to see more good done in his wife's name. While most online and print resources note that Kelsey hired Cass Gilbert as the architect of this building, the Kelsey Building is noticeably absent from the listings of Gilbert's completed works. So it is not clear to me how much Gilbert was involved in the project. He was working on the Woolworth Building in New York around the same time, and Kelsey certainly had the awareness of Gilbert's significance as one of the greatest architects of the time. 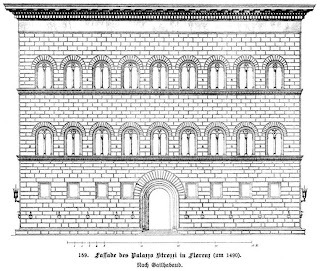 Regardless, Kelsey wanted the memorial building to echo one of his wife's favorite buildings: Palazzo Strozzi in Florence. The result is one of Trenton's best buildings. The entry is oriented towards State Street and is expressed with a heavily articulated brick and tile arch. Over this arch, a clock extends out from the mass of the building (the clock originally did not function- it always showed the exact time when Mrs. Kelsey passed away). Above the clock are three grand brick arches infilled with copper windows and decorative panels which turn the corner and continue to march down Barracks Street. The building is crowned with the most recognizable quote from Strozzi: a copper and terra-cotta roof cornice. As the city moves forward with new educational facilities, its important to remember the significant cultural meaning possible through architecture. I doubt that we will or should see an authentic Italian Renaissance Revival building such as this arise again, but architectural quality goes far beyond style. I hope that we as a city recognize our long history of great architecture, and that with new projects, new opportunities present themselves. We can not go back to an era of cheap labor and incredible craftsmanship, but we should be able to inject a narrative, a sense of place, and an aesthetic of permanence into our most modern buildings. All it takes is a little love.